Participants will go through a round of Kitchen themed, Foodbank Game Challenge, such as “Canned Wrecking Ball”, “Ping Pong Wok” to earn shopping credits and grocery coupons. Once teams have completed the Foodbank Game Challenge, they will be gathered together for a round of Supermarket Sweep. ​In this challenge, teams will need to selectively choose the grocery items, so that the total price of the items is closest to the shopping credits they have. Teams would also need to decorate the items into a hamper for the families receiving the items. At the end of the session, teams will be graded base on their accuracy in their price selection and the decoration of the hampers. “We are truly grateful for this chance to return back to those less fortunate than us. 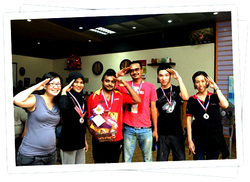 Through teambuilding fun, we experience humility and gratefulness. Finally a teambuilding that doesn't waste! Thank you for the great experience, Biking Singapore!"